It’s no secret that I love to cook. It’s also no secret that I’m pretty disorganised. Ironically, since I’m a PA by trade, I sometimes find keeping a grip on my personal life a little difficult. But I’m trying and I’m slowly improving. One area where I do tend to be a little better at planning is with our meals, probably because there are very few things I enjoy more than surrounding myself with recipe books and making lists – which is essentially what meal planning is. Today, I’m sharing my process and the tips that I’ve picked up in the ten years I’ve been exploring home cooking. 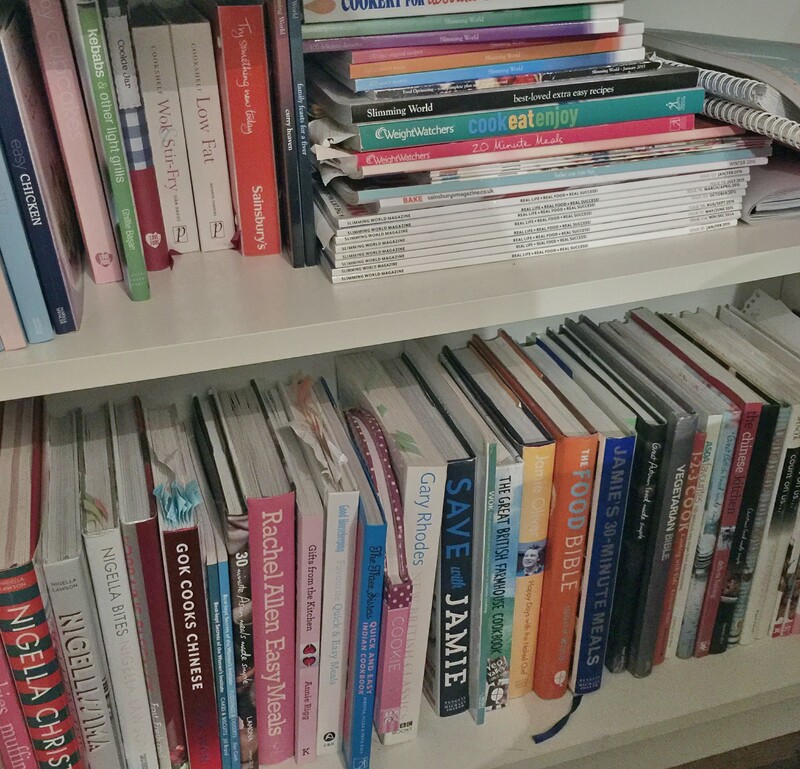 I have several bookshelves which have practically collapsed under the weight of my cookbook collection. There is at least one on every Christmas & Birthday list I ever have and I’m addicted. I know it’s not strictly necessary to collect books now when we have millions of recipes available at the tap of the Pinterest app but there is something so enjoyable about thumbing through a big, glossy book and marking the pages of everything I can’t wait to eat. And cookbooks don’t have to be an expensive thing to collect either. Lots of mine come from places like The Works and only cost a few quid. And if you do want the latest celebrity chef book (I’m currently hankering for Jamie’s new one) check out the supermarkets or The Book People who often have half price deals even on brand new publications. This is something that develops over time, rather than when you’re just starting out with home cooking, but having a list of 20-30 meals that your family know and love, readily at your fingertips can make meal planning so much easier. Many of ours I’ve either created myself or I know the recipe off by heart, and at least half of my weekly meal planning schedule consists of these favourites. (You can find some of mine in the recipe section). And remember that this list can (and should) evolve over time so you don’t get bored of the same old thing. I look for recipes everywhere and, aside from cookbooks, I get most of mine from magazines like Asda’s Good Living or printed from the internet. I find having a paper copy of a recipe in front of me is lot easier than reading it from my phone when I’m chopping and stirring. I also watch tons of cooking shows and foodie You Tubers for education and ideas. 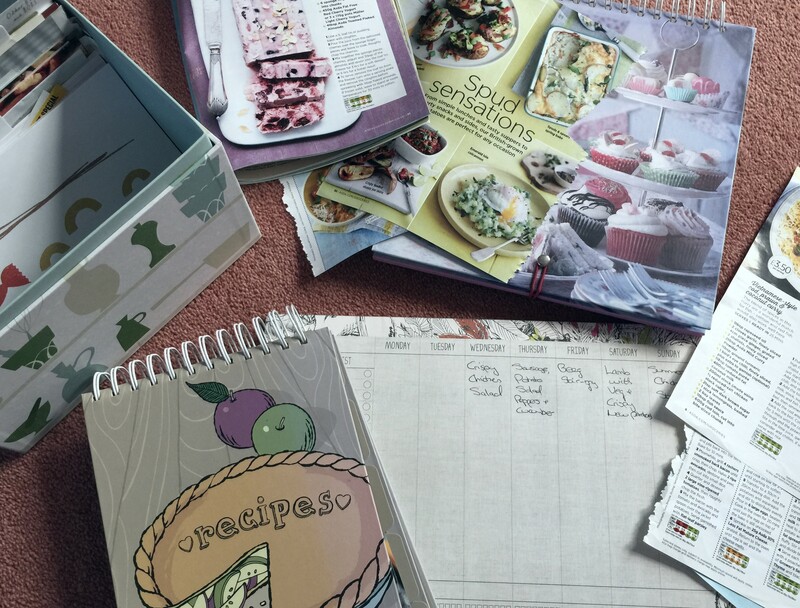 Since I get my recipes from anywhere and everywhere it helps to have somewhere to keep them all together – I’ve got several recipe planners (similar to this one from Paperchase), a scrapbook & recipe box. If you’re still struggling for meal planning inspiration why not ask those around you for copies of their favourite recipes too, even better if it’s something they’ve cooked for you and you’ve really enjoyed. I’ve often thought about beginning a Facebook group recipe exchange so watch this space for more on that. This sounds a bit crazy, I know, but when we’re doing a “big shop” (which lasts us two to three weeks) we sometimes visit three supermarkets in one go. There are certain items that I need for regular meals that I know are only available, or most cheaply, available at particular stores. Getting familiar with offers and availability can often help save cash. It’s pretty rare that I stick religiously to a recipe – there is usually an ingredient we don’t like or can’t find and we just switch it for something else. It’s from this that I started creating some of my own recipes too. I make a list of the meals and where I found them, and keep all the clippings or books I’ll be using to one side for easy reach throughout the week. I write a full shopping list, including the items I’ve written down from the recipes as well as our usual items, and I try to order my list in sections (fridge, fruit & veg, toiletries etc) to make shopping easier. I use our social plans for the week ahead, plus my guestimate on how long certain ingredients will last, to decide which days we will probably have which meals, and then I complete my meal planning sheet for the next week or several weeks. I use a magnetic meal planner similar to this and you can buy these everywhere now, or just create your own. I don’t want anyone to think I plan every single meal we have – we still have plenty of impromptu takeaways and frozen dinners, especially on the two days a week I’m at work. Even when I do stick to my plan for the week I often switch the days around depending on what we fancy, or when I realise something is going out of date! I figure all organisation is about doing our best rather than getting things perfect – we’re human after all and we still need some spontaneity in our lives! 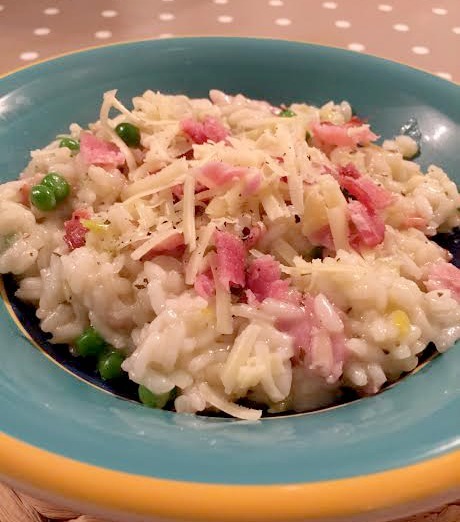 If you’d like more recipe and meal planning ideas please feel free to follow me over on Instagram at butterflymum83 where I often post cooking videos and ideas for dinner on Insta Stories.